I can't even tell you guys how pumped I am. The last time I saw Devils playoff hockey was in 2009. And we all know what happened that year. In 2010, when we were ousted by Philadelphia, I did not get to see one game because I was at CG boot camp. And then last year, obviously we missed out. So for me it feels like an eternity. I know I am going to sound like a broken record by the time this is settled Saturday night, but for the love of the hockey gods, FLORIDA can you PLEASE GET A POINT!! I already purchased tickets to Game 1 at the BankAtlantic Center. I don't want to waste a four hour drive to see the friggin' Rags play them! Screw that. I am so damn excited. Best time of the year. What about the njdevs banner with the 3 cups?? My goodness, Zubie has a point! I'm very excited but my excitement is tempered by the the lackluster effort our team has put forth in recent years in the playoffs. It seems we can't make it out of round 1 and I think we need a serious run this year. I had such high hopes a few years ago when we lost to Carolina. Drawing the Flyers two years ago was just awful. Worst match up possible. I was so mad when we beat the Sabres in the final game to draw the Flyers. They were a team I did not want to see. I think we are in a great spot this year. Our bane is Boston and Pittsburgh I think and if we can avoid them until the ECF I'll be happy. Of course that's just such a long way away. Let's just get out of round 1 for a change for the love of Pete. I want to and hope we go all the way and just win 16 more games, but in reality i feel another first round exit. I don't feel like this team has the depth needed to get through to the second, third round, let alone the finals. I hope to god they prove me wrong but I can't get my hopes up again after these recent years. 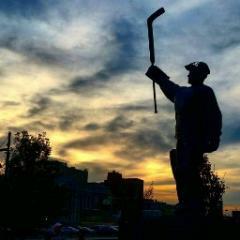 There isn't exactly much to choose from as far as avatars on the site, at least not real hockey-related ones. There used to be quite a few, I don't know what happened to them all. EDIT: Nevermind, figured how to upload one of my pictures and turn it into an avatar...I might have to find a more clearer one than the scoreboard during Marty's #552. Wow...what happened to The Capitals this season? Normally, I'd say they could rock NYR, but will they? They will give them a run for their money. Rangers in 6 or 7. Or, NYR could completely collapse and lose in 5 or 6. I've been calm since we clinched, but my excitement is growing exponentially day by day. "GET YOUR JERSEY ON!" LGD!! Off the bat, two awesome matchups. I want Philly to win but my gut is telling me Pittsburgh in 5 or 6. The first western series is going to be a dogfight, pulling for Nashville though. Yep. Two very good teams are guaranteed to be eliminated right off the bat. Loved the fan salute after the final home game of the regular season.. Started last year and appears to now be a tradition.. Definitely got me fired up for the playoffs! !